Though Mixpresso’s unit does not let you push a button and dictate an exact temperature, it does have three temperature settings: a setting for frothing hot milk, a setting for frothing cold milk, and a setting for producing hot milk unfrothed. Specialty coffees and rich cocoa you can drink at will. 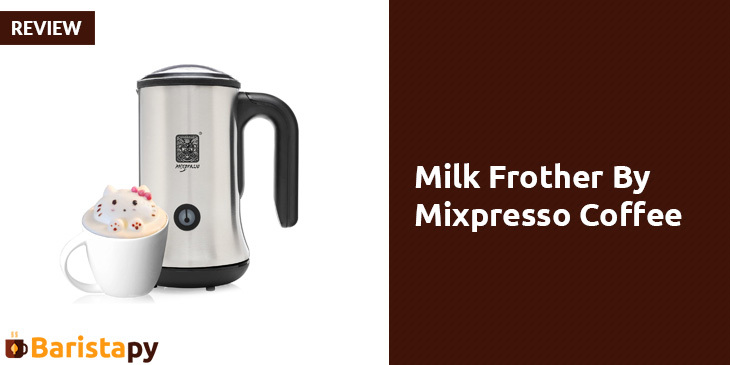 Mixpresso Coffee offers a frother that works fast. It tells you when frothing is complete. And the container can hold enough milk to deliver 150 ml or 5 ounces of froth. When it comes to heated milk, the capacity grows to 450 ml, or 15 ounces of liquid. So this unit is built for single servings of the specialty coffees that call for froth. However, it is bigger than same frothers with dimensions of 10.1 x 8.8 x 5.8 inches. Constructed of stainless steel—the sturdy material you want. And insulated with vacuum insulation i.e. 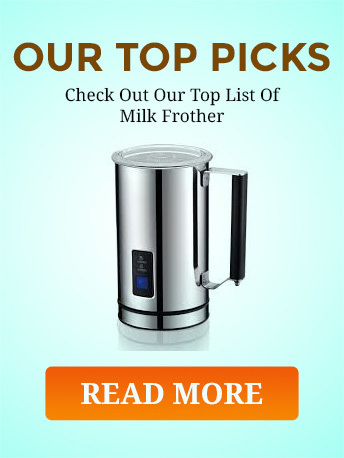 it insulates the milk by way of a layer with the air removed. Thus, heat or cold is absorbed and stored well in the container walls. And the milk is kept. The carafe easily lifts out from the base. Thus, pouring is simple. And the unit is under 3 lbs. At a 2.8 lb. weight. Mixpresso sells both coffee and coffee makers and appliances. They back their products with a warranty that extends to 2 years on parts and workmanship. Mixpresso also supports their customers via a toll free phone line. 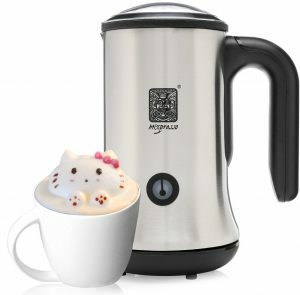 The Mixpresso Company brands its goods, “made in Italy.” And, I note, cappuccinos are Italian coffee drinks. Q: Will this product stand the test of time? A: I point you to the 2 year warranty behind the Mixpresso frother—a warranty period twice that of competitors. Another lower priced unit made of sturdy stainless steel. Compare it carefully with the VonShef product. The free shipping with the VonShef could be the deciding factor.